Cofete beach is not suitable for bathing. There’s something mysterious in it. Deserted, solitary, lonely, and in the background you can see the 800 m high mountains of Jandia where the clouds get caught. The weather is always breezy and the waves are very high. The beach appears breathtakingly eerie but nevertheless beautiful! You shouldn’t bathe here because of the high waves and the strong current. On the approx. 2-3 km long beach there are no tourists or locals. The beach is also absolutely unsuitable for children. 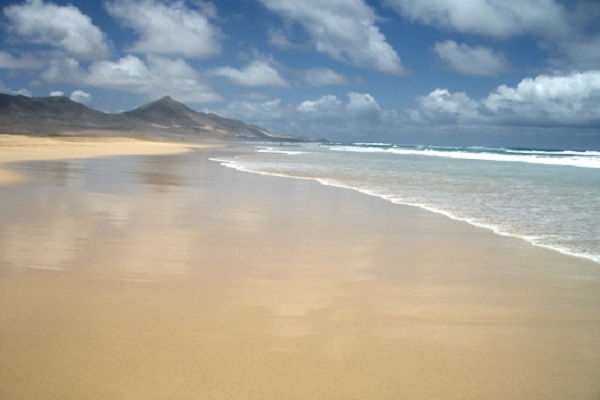 If you visit Fuerteventura, you should take a day’s time for exploring this piece of pristine nature. Apart from that there are no other sights but the mysterious “Villa Winter”. Moreover, there’s also the little village “Cofete” with a pub. How to get to the beach: Don’t drive straight on to the port of Morro Jable but turn right (see picture). First this road is still asphalted but after approx. 2 km it turns bumpy and rocky. Here you go on for approx. 12 km until you reach a fork. On the left-hand side the road leads to “Puertito”, on the right-hand side to “Cofete” (see picture). Here you turn right. Now you follow this way for 8.2 km. The road leads directly to Cofete beach. Parking options: On the beach.